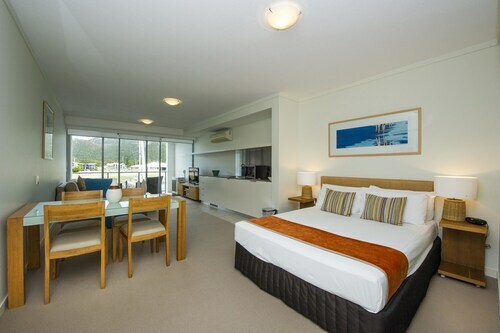 Situated near the bay, this luxury hotel is 2.5 mi (4 km) from Magnetic Island Golf Course and within 6 mi (10 km) of Magnetic Island National Park and Horseshoe Bay Beach. Radical Bay and Strand Waterpark are also within 9 mi (15 km). This Arcadia hotel is on the beach, 2.9 mi (4.7 km) from Horseshoe Bay Beach, and within 6 mi (10 km) of Radical Bay and Magnetic Island Golf Course. The Strand and Magnetic Island National Park are also within 12 mi (20 km). 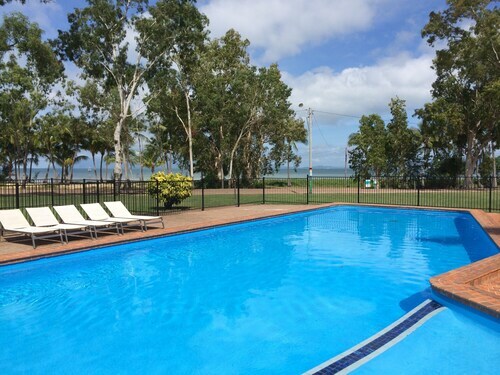 Situated near the beach, this aparthotel is 2 mi (3.2 km) from Magnetic Island Golf Course and within 6 mi (10 km) of Magnetic Island National Park and Radical Bay. Horseshoe Bay Beach is 4.9 mi (7.9 km) away. 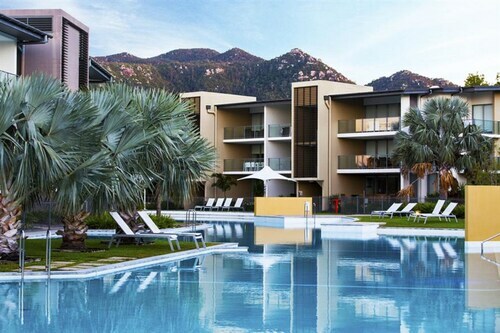 Situated in Nelly Bay, this luxury apartment building is 2.6 mi (4.2 km) from Magnetic Island Golf Course and within 6 mi (10 km) of Magnetic Island National Park and Horseshoe Bay Beach. Radical Bay and Strand Waterpark are also within 9 mi (15 km). 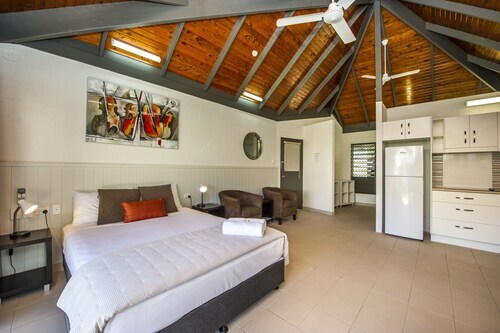 Offering direct access to the beach, this Arcadia guesthouse is 3.1 mi (5 km) from Magnetic Island Golf Course and within 6 mi (10 km) of Horseshoe Bay Beach and Radical Bay. The Strand and Magnetic Island National Park are also within 12 mi (20 km). 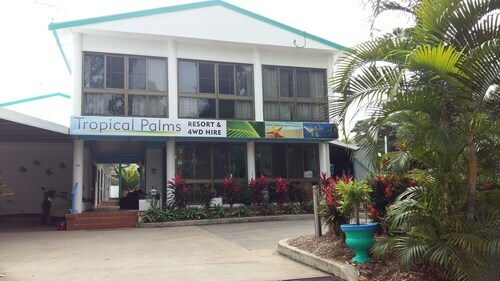 Situated in Picnic Bay, this motel is 0.6 mi (0.9 km) from Magnetic Island Golf Course and within 9 mi (15 km) of Magnetic Island National Park and Radical Bay. Horseshoe Bay Beach and Strand Waterpark are also within 12 mi (20 km). 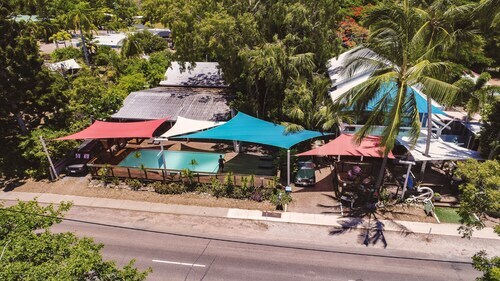 Situated near the beach, this hostel is 0.6 mi (0.9 km) from Magnetic Island Golf Course and within 9 mi (15 km) of Magnetic Island National Park and Radical Bay. Horseshoe Bay Beach and Strand Waterpark are also within 12 mi (20 km). 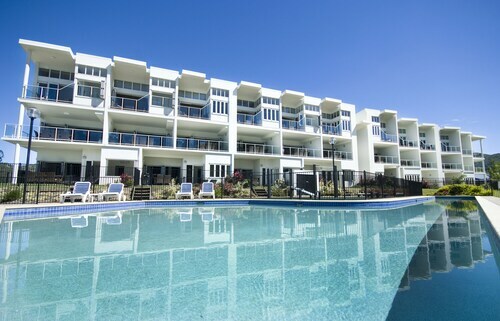 Situated near the beach, this luxury apartment building is 2.2 mi (3.5 km) from Magnetic Island Golf Course and within 6 mi (10 km) of Magnetic Island National Park and Horseshoe Bay Beach. Radical Bay and Strand Waterpark are also within 9 mi (15 km). Offering direct access to the beach, this Horseshoe Bay apartment building is 0.1 mi (0.1 km) from Horseshoe Bay Beach and 1.9 mi (3.1 km) from Magnetic Island National Park. Radical Bay and Magnetic Island Golf Course are also within 9 mi (15 km). If you want a tropical island holiday with plenty of things to do, feel the pull of Magnetic Island! This gorgeous Whitsundays destination can be as relaxed or as action-packed as you like. With 23 stunning beaches, walking trails with awesome views and superb food, Magnetic Island combines the best of the great outdoors with the comfort of civilisation. 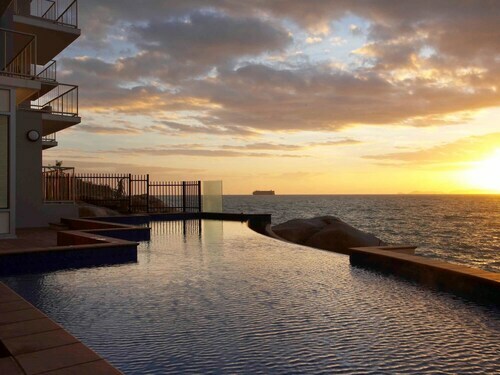 Book one of our Magnetic Island hotels today and be sucked into paradise. Captain Cook gave Magnetic Island its name because he believed the iron in its hills tinkered with his compass when he sailed past in 1770. While he wasn’t correct, this island does have a certain allure with its unusual and lovely landscape. Take a trip to the beach and you’ll see headlands dotted with giant boulders caused by volcanic activity millions of years ago, as well as hoop pine trees and white sand. Some of the boulders are likely to be bigger than your house, so Indiana Jones-style escapades probably aren’t a good idea. What IS a good idea? Spending the day on the beach! Take a swim, rent some snorkelling gear or dive a little deeper with a scuba diving tour. To stay a little drier – though no guarantees – hire a canoe or aqua bike or, for a bit of speed, take a jet ski tour and zoom around to explore the island’s gorgeous waters. If you’d prefer to slow it down a bit, meet and greet some of the local wildlife on a sea kayak tour. Morning or sunset, you can kayak to some of Magnetic Island’s most secluded bays teeming with local wildlife like birds, turtles, dolphins and whales. Since Magnetic Island puts you so close to the stunning Great Barrier Reef, why not get even closer and snorkel some of it? If that’s not exciting enough for you, maybe you’re into shipwrecks? Adventurous sorts can scuba dive to the wreck of the S.S Yongala. You can even go horse riding or skydive onto the beach. Magnetic Island National Park covers just over half of the island and will take you through rainforest, bushland, mangrove pockets and to headland lookouts with sweeping ocean views. Drop into the Barefoot Gallery in Horseshoe Bay to see paintings, pottery and sculpture by talented local artists, or tee off at the Country Golf Club, in Picnic Bay. When it’s time for some food, there are plenty of options from a theatre restaurant to fish and chips to fancy cuisine. Wot are you waiting for? If you still haven’t seen Queensland’s Whitsundays or its famous reef, get started with our great range of Magnetic Island accommodation. How Much is a Hotel Room in Magnetic Island? Hotels in Magnetic Island start at AU$62 per night. Prices and availability subject to change. Additional terms may apply. 6 days ago by A verified traveller from Townsville. Lovely view and location. Little bit worn and grotty.